The Smithsonian-affiliated Annmarie Sculpture Garden & Arts Center is the perfect meditative blend of natural forest, manicured landscape, and human-sculpted abstract art. Located in a leafy peninsular nook between the Patuxent River and the Chesapeake Bay, the 30-acre center contains dozens of permanent fixtures as well as installations on loan from the National Gallery of Art and the Smithsonian Intuition. A quarter-mile elevated boardwalk meanders through the garden, where Stonehenge-like rock arrangements, gorgeous metal loops, contemplative human forms, and moss-encased natural sculptures sit spread among the leaf litter. Near the entrance, an indoor gallery and event space offers rotating exhibits. Though open year-round, the best time to visit the garden is during spring and summer, when holiday-themed festivals and events bring the landscape to life. 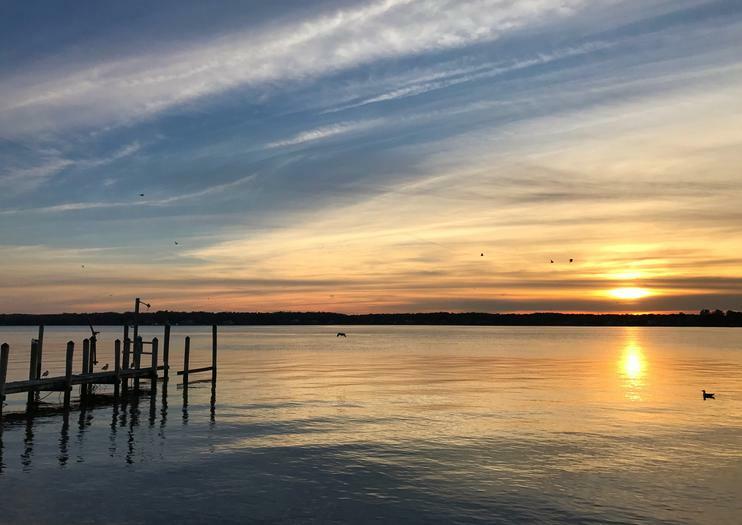 The gardens make a great day trip from Washington D.C. or downtown Baltimore, and can be visited on a relaxing tour of Solomons Island, with wine, lunch, and dinner included. Annmarie Sculpture Garden & Arts Center is located in Dowell, Maryland on Solomons Island near Chesapeake Bay. The closest major cities are Washington, D.C., located 65 miles north of the attraction, and Baltimore, located 79 miles north of the attraction. The sculpture garden is open daily from 9am to 5pm, and the arts center is open daily from 10am to 5pm. Visitors typically spend about two hours at the gardens. Admission is $5 for adults, $3 for kids (6-17), and $4 for seniors and military.